The hilarious, implausible, and touching story of twin brothers accomplishing the impossible -- making a feature film (with a cast and crew with 11 Academy Awards and 26 nominations) with no experience, no money, and no contacts. When identical twin brothers Logan and Noah Miller's homeless father died alone in a jail cell, they vowed, come hell or high water, that their film, Touching Home, would be made as a dedication to their love for him. Either You're in or You're in the Way is the amazing story of how -- without a dime to their names nor a single meaningful contact in Hollywood -- they managed to write, produce, direct, and act in a feature film alongside four-time Academy Award-nominated actor Ed Harris and fellow nominees Brad Dourif and Robert Forster. 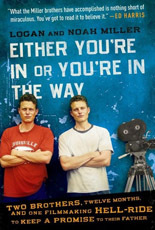 Either You're in or You're in the Way tells of the desperate struggle of two sons fighting to keep a vow to their father, and in so doing, creating a better life for themselves. A modern-day Horatio Alger on steroids, this fast-paced thrill ride of heartbreak and redemption will both captivate and inspire.